Please LIKE, SHARE, SUBSCRIBE so your kids won't miss an episode! Daily videos :) Thanks for watching, leave happy comments. Please LIKE, SHARE, and SUBSCRIBE for daily kids videos! Video : OPENING Play-Doh SURPRISE Angry Birds! Opening Play-Doh SURPRISE Super Hero Angry Birds! 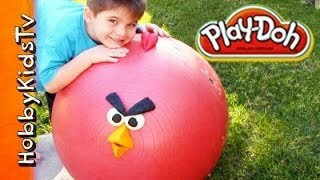 Opening a GIANT Angry Birds Egg, Play-doh Peppa Pig Surprise and More!